Jill has learned the truth of what her friend Rosine has become, but the idea of becoming an “elf” still appeals to her. Growing up abused, like Rosine, she doesn’t want to return to her village. She hates her father and fears becoming a weak woman like her mother. If she allows Rosine to transform her, she can be free of that. But Guts, wounded, driven by his rage, shows her the truth of Rosine’s transformation. Her friend has become a demon. That sweet girl she used to play with as a child has become a monster. And even this inhuman monster is scared of Guts. Rosine will have to reveal her true form to defeat Guts. But will it be enough? Or will she be the next demon slain by the Black Swordsman? This arc is more about Jill and her loss of innocence as she sees the brutality of the world and what it takes for a man like Guts to survive in it. Her transformation over these pages as she survives these terrible events gives us a glimmer of hope that this world isn’t wholly lost. Even as Miura makes us feel pity for the monstrous Rosine, he shows us that Jill might have the strength to do something good in this world. Either way, Guts continues on only now he’s hunted by the Holy Chain Knights led by Farness. After two years of following his trail of destruction, they have finally caught up to Guts. He’s wounded form his fight with Rosine. Will he escape, or will they take him prisoner? BERSERK continues to impress. Miura shows us how the cruelties we inflict on each other can create new monsters. Because that’s the true essence of this series: all the evils, all the atrocities, all the demonic entities are just humans who have given into their selfish natures. Whether it’s Rosine who wants her childish paradise or Wyld who wants to be powerful again, the evil in BERSKER is spawned by human weakness. So can there be any hope in such a bleak and nihilistic world? Maybe. There’s Puck the Elf. There’s Jill. And maybe even Guts can find his way out of his darkness before the beast of rage inside of him consumes him. This is why BERSERK is one of the greatest works of fantasy literature and art produced in the world. If you’re not reading it, you should be! 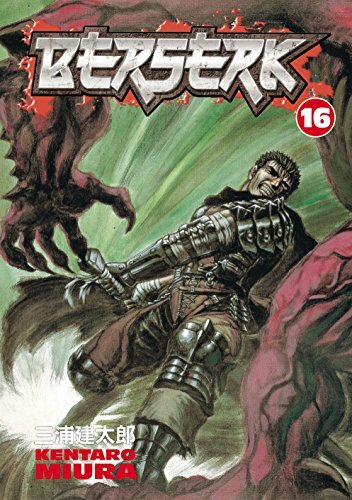 You can buy BERSERK Vol 16 from Amazon.